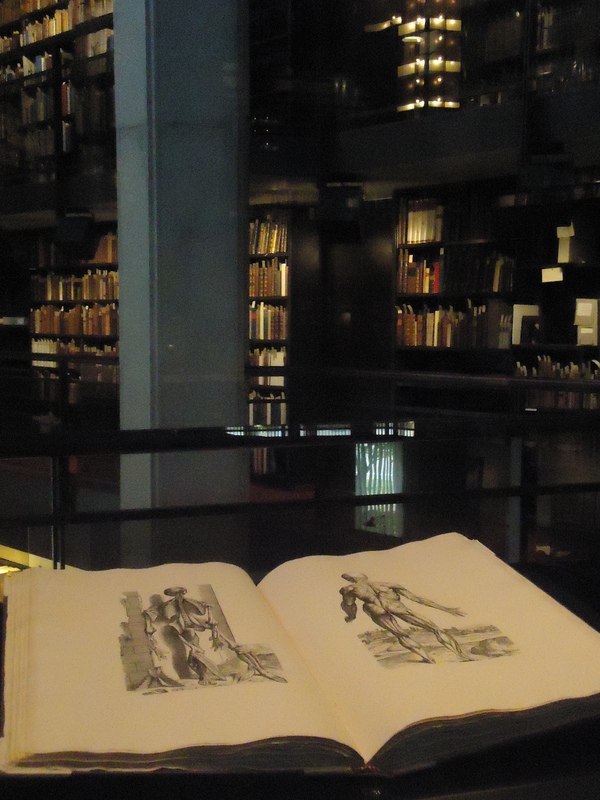 Earlier this week I finally found the time to check out the exhibit, Vesalius at 500 at Thomas Fisher Rare Books Library in Toronto, curated by Philip Oldfield. 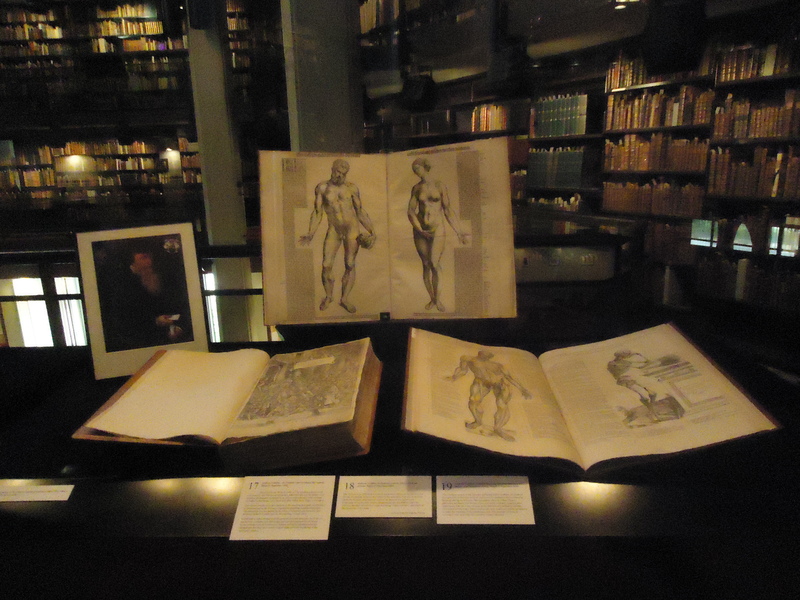 The exhibit chronicles the history of anatomy and anatomical illustrations prior to, and following, the anatomist Andreas Vesalius’ (1514-1564) publication of De humani corporis fabrica (The Fabric of the Human Body), which was first published in 1543. De Fabrica exemplifies the perfect marriage between art and anatomy, between text and illustration. It is enormously detailed, brilliantly and profusely illustrated and helped to spearhead the new method for anatomical studies in which the anatomist combined the roles of dissector and instructor. 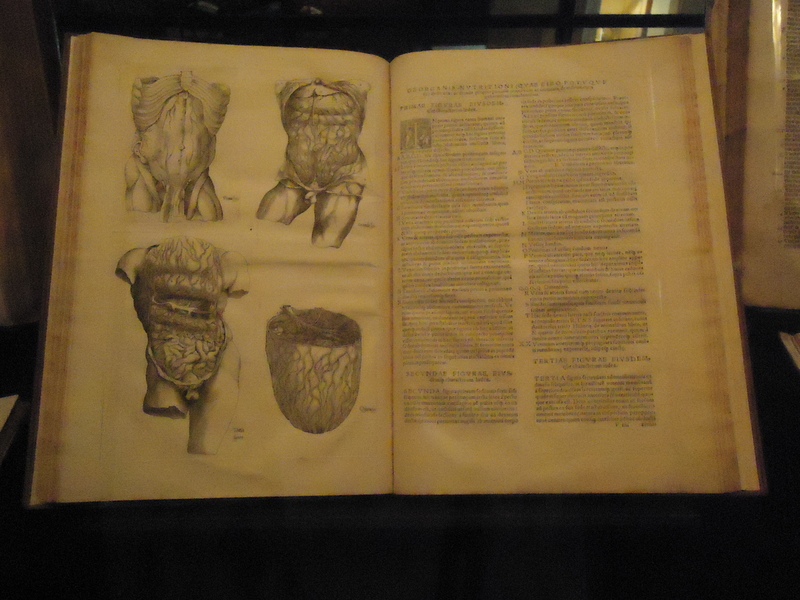 Moreover, the book set the standard for all future publications of anatomical illustrations. 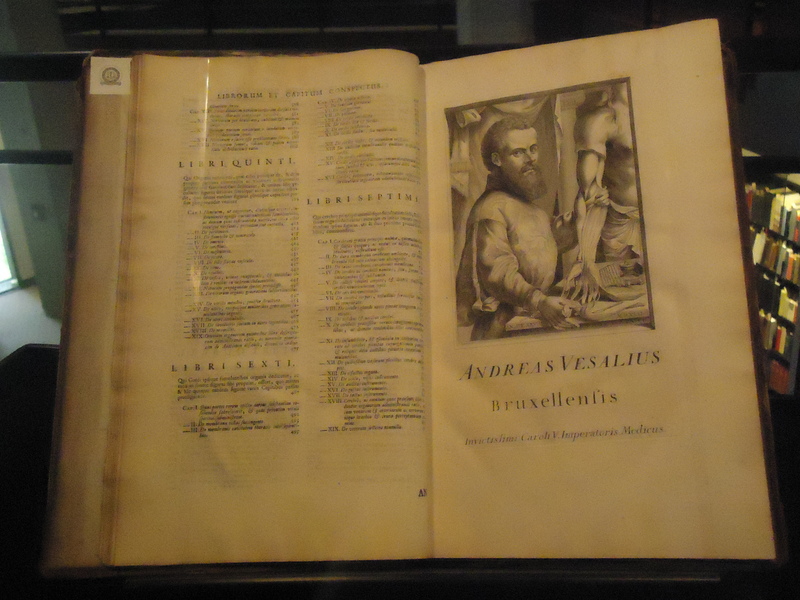 With de Fabrica, Vesalius introduced a number of important changes in the study of anatomy, including the notion that students must not depend their learning from authoritative textbooks, or even their teachers. 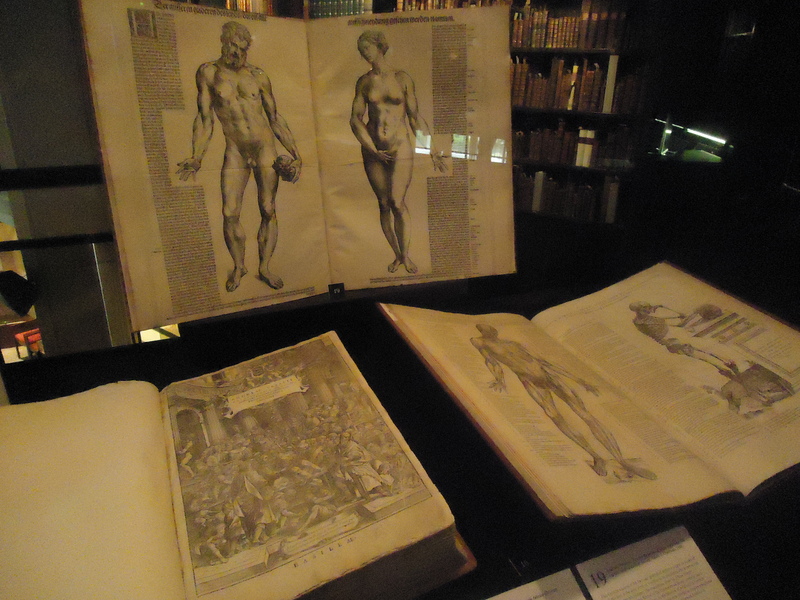 Rather, Vesalius advocated the humanist doctrine to see for oneself: students should see and understand anatomy by looking and investigating the bodies themselves. Truth could be found under the skin, not in the books. While de Fabrica did not outline any shattering discoveries, Vesalius did correct 200 previously unquestioned theories, many of them from the Greek surgeon Galen’s works, which significantly relied on animal cadavers for anatomical studies. Other anatomists had previously criticized isolated pieces of Galenic anatomical doctrine, but de Fabrica was the first publication to systematically demonstrate how Galenic anatomy was mistaken. As you can see below, de Fabrica is noteworthy for its illustrations, which were drawn by the Dutch artist Jan Stephan van Calcar (1499-1546). Vesalius used these technically accurate drawings of the dissected body to incorporate realism and reveal the process of dissection. De Fabrica thus laid the groundwork for observation-based anatomy, emphasizing anatomical statements could only be revealed by examining human cadavers first hand. Please excuse the poor quality of some of the photos; I was not allowed to use my flash camera. In the second edition of De humani corporis fabrica libri septem (Basel: J. Oporinus, 1555), the entire text was reset, with more space between lines and illustration; passages were deleted or amended. Most of the changes were stylistic. 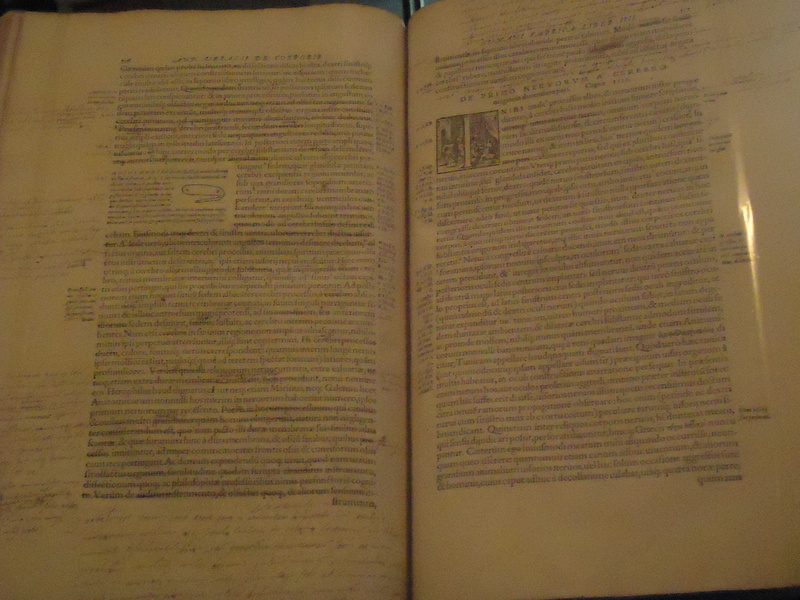 This is a copy of an extensively annotated second edition with Vesalius’ notes, revealing that Vesalius intended to publish a third edition that never came to pass. When Vesalius sent his manuscript and woodblocks of illustration to his printer Johannes Oporinus, he attached a letter with specific instructions for printing. The letter included descriptions on how to align the text and illustrations. 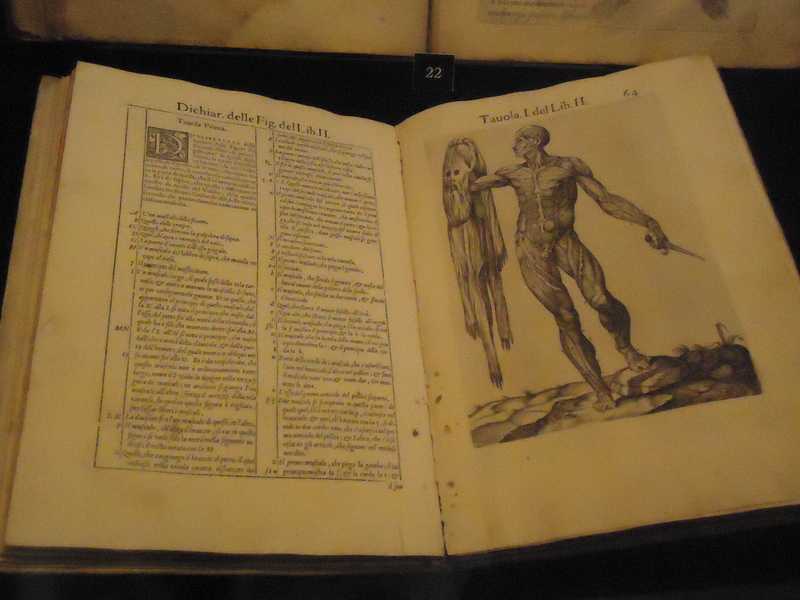 As well, Vesalius asked Oporinus to forbid anyone from printing any of the illustrations without his consent. This book is the first unauthorized reproductions of the plates of Fabrica: Thomas Geminus, an engraver and printer from Flanders, who produced Compendiosa totius anatomie delineation (London: John Herford, 1545) under the command of King Henry VIII of England who wanted to improve the state of surgery. The Compendiosa was the first English book to have an engraved title page. In 1553, Geminus produced an English version for surgeons who did not know Latin; the English version was re-issued in 1559 with an engraving of the newly-crowned Queen Elizabeth. Another plagiarism: Juan de Valverde de Amusco, Anatomia del corpo humano (Rome: Ant. Salmanca & Antonio Lafreri, 1560). The exhibit continued downstairs, but there was a class present. Alas, I didn’t get a chance to take a look at the second part of the exhibit. Go check out the exhibit when you can–it closes August 29. You can see more illustrations from de Fabrica here.